More than 17,000 art lovers from South Florida and around the world converged on Miami Beach recently for the Miami International Art Fair. As fairgoers browsed through more than 1,000 pieces of fine art, sculpture and new media on display, they also received texts. 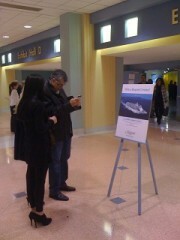 Art lectures, book signings and even live painting were all events promoted by mobile marketing texts. 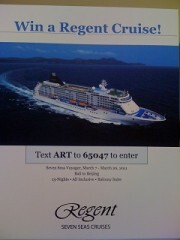 By texting the word “ART” to 65047, guests not only received updates on events, they also entered a contest for a Regent Cruise. But this was not your average cruise! It was a 14-day luxury cruise from Bali to Beijing. Lucky winner. Lee Ann Lester, co-founder and director of the fair, was enthused by mobile marketing results and plans to continue using text messages at the next fair: Art Palm Beach. 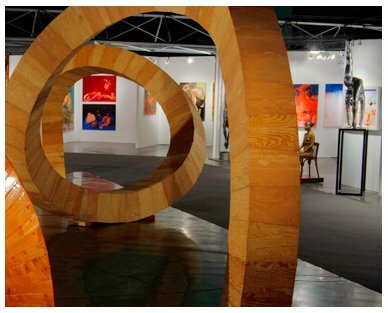 Overall, the Miami International Art Fair was a great example of how mobile marketing can be used to promote events, contests and brands overall. Using the last text message of the event to promote the next event! Need ideas for your own business? Let us know. I’m Marcos Menendez, co-founder of Momares.com- Mobile Marketing for the Rest of Us. There are 31M small business in the US, let’s say you happened to own one. The famous Restaurant Du. You just received confirmation that you friend, celebrity Chef Emeril Lagasse will be helping you cook tonight only. 2 minutes later you receive you first reservation. The Launch Pad at the University of Miami announced the finalists for the 2010 Elevator Pitch Contest sponsored by The Miami Herald. Over 140 businesses entered, and after four preliminary rounds held throughout South Florida, just 22 contestants remain. Momares is seen as an underdog in this contest and hopes to impress the judges in the final on Tuesday, November 16 at 6:30 p.m. at the University of Miami – Storer Auditorium. 1. Provider: Find a text message marketing company (momares.com) that provides you with a short code (the number subscribers will use to send the message to) and allows you to register keywords (the word the subscriber will use to subscribe) Ex. Text JOEPIZZA to 65047 for a free order of breadsticks.” KEYWORD: JOEPIZZA, SHORTCODE: 65047. Register a keyword (free trail). 5. Frequency: Text messages are very personal. Only send messages when you have something your recipient will value. Ex. Just received the new Jimmy Choo boots. 10 pairs available for the season. Show text to get 5% off. Bad Example: The new Jimmy Choo boots are beautiful! Come in to see them! Need ideas for mobile, send me an email.